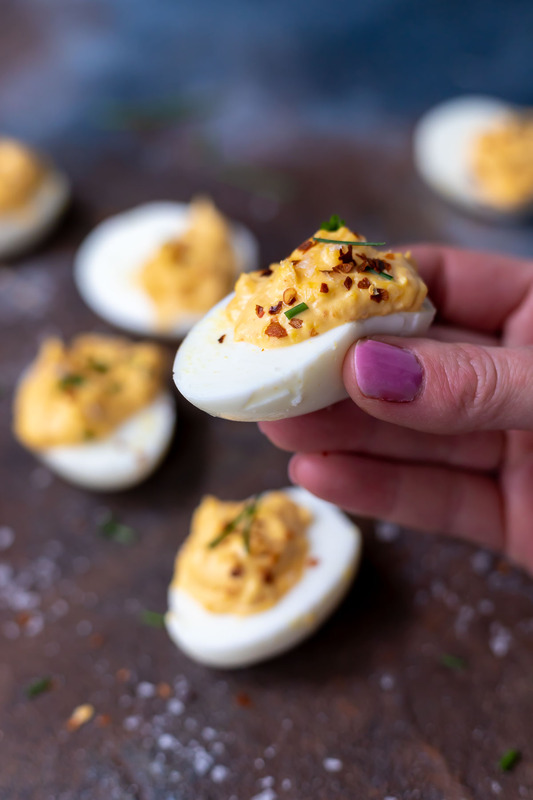 Spicy Deviled Eggs bring a little heat to your favorite appetizer! 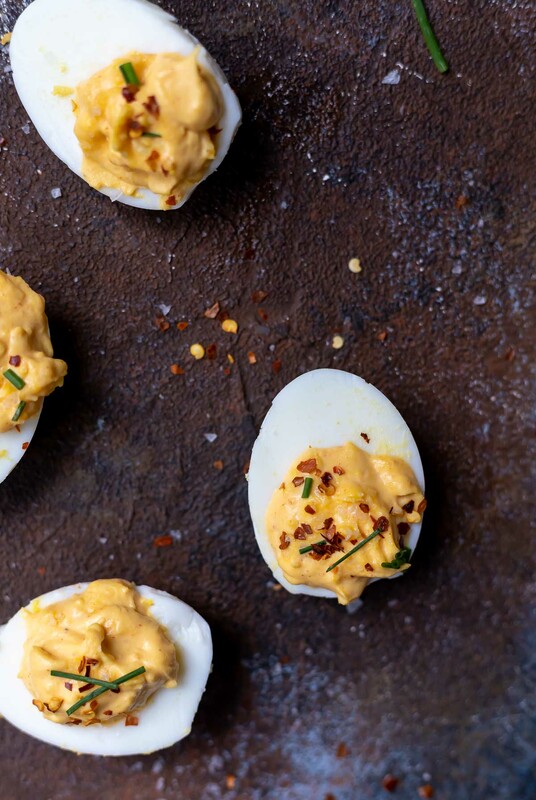 This deviled egg recipe includes a splash of hot sauce and chili flakes on top. The perfect amount of spiciness in an awesome low carb snack. 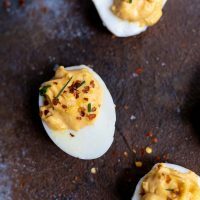 Deviled Eggs are my jam! Seriously, I’m not really a big egg person but deviled eggs are another story. I can easily plow through a plate full of them. 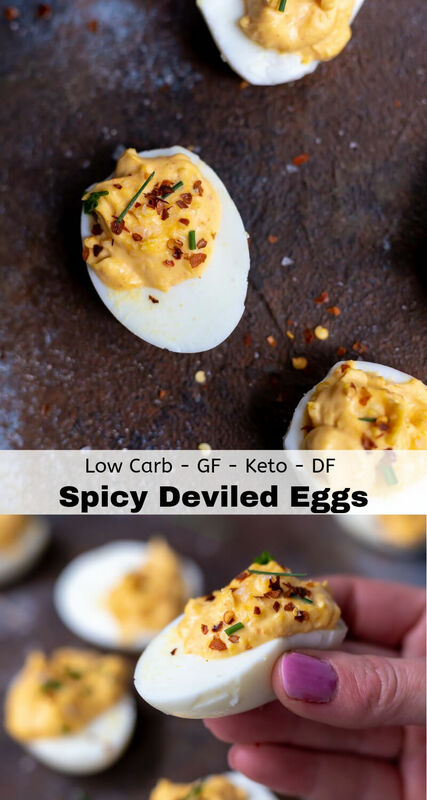 My favorite thing about deviled eggs is how they can be flavored in so many ways. From traditional to loaded to spicy. . . the possibilities are endless. You could also do Oven Baked Hard Boiled Eggs. I’ve use that method and it works well. I’m not gonna lie, I have been know to massacre my eggs while peeling them. I just don’t have a gentle touch. Slipping a small spoon under the shell then lifting up has been working great for me. . . very few egg casualties. There are always the Deviled Egg Trays. Or you can use a muffin tin to transport deviled eggs. Cook your eggs however you prefer: boiled, air fried or baked. Transfer egg yolks to bowl, add mayo and hot sauce. Mix until creamy and smooth. Spoon yolk mixture into egg whites. Top with flaked sea salt, red chili pepper flakes and chopped chives. Smoked Salmon Deviled Eggs: Smoke salmon, lemon and fresh dill take these eggs to the next level. This is an appetizer that will surely impress. 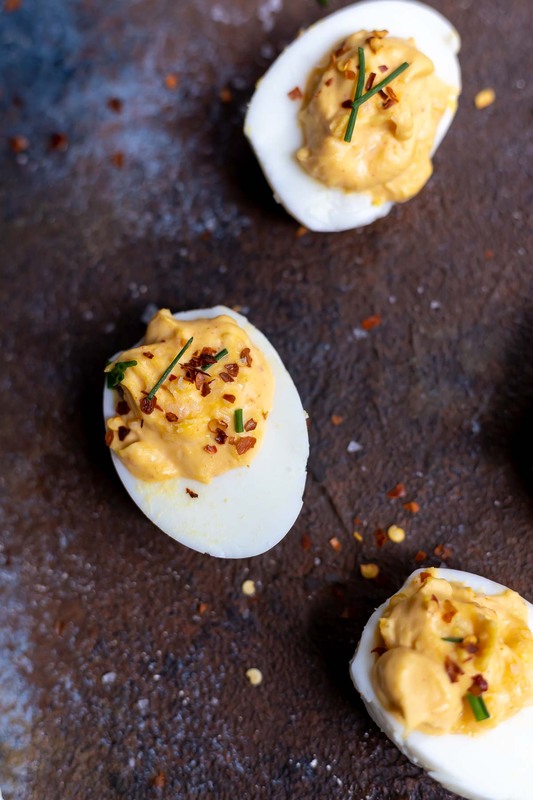 Pimento Cheese Deviled Eggs: Two southern classics collide in this quirky egg recipe. Deviled Soy Sauce Eggs: Yes, these are definitely unique. 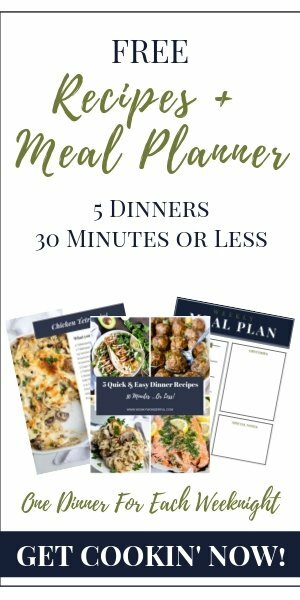 If you enjoy trying new things that are fun and interesting, this recipe is for you. Deviled Egg Salad: Make it into a meal instead with this egg salad. This would be great served with bread, crackers or chips. *1/3 cup mayo will make extra creamy filling. Reduce to 1/4 cup if you prefer a thicker filling.